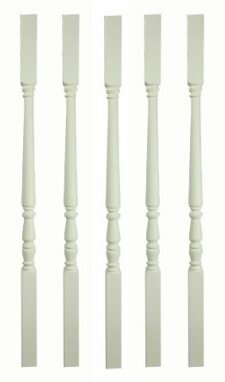 Baluster is the American word for spindle, a vertical rod that acts as the infill between the handrails and baserail. 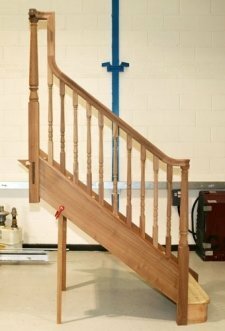 Pear Stairs has a large selection for your staircase. 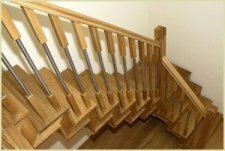 We can offer wooden balusters , metal balusters and metal spindles with wood . Visit our online shop to see the different types and sizes available. 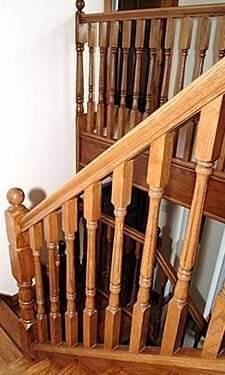 Picking the right baluster is important, as the wrong choice can ruin the look of your stairs. 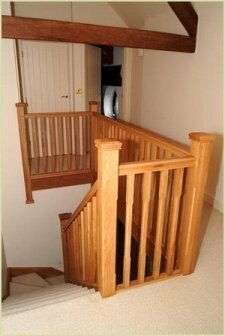 Luckily, with our extensive selection, you are sure to find a baluster that goes with your staircase. Our range spans modern and traditional, cutting-edge and classic. 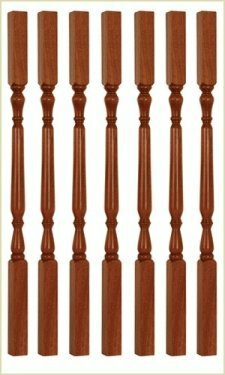 Our most popular balusters are made from oak (both American and European), ash, pine, hemlock and sapele. However, we produce an incredible variety in many other types of wood, in metal, or in mixed materials such as wood and stainless steel or wood and acrylic. 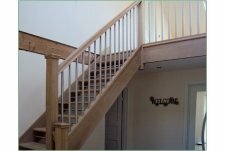 If none of the balusters on this page are right for your stairs, let one of our design team know. 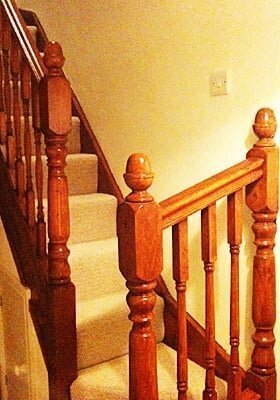 We are always willing to customise, and will be able to help you come up with the perfect baluster design just for you. 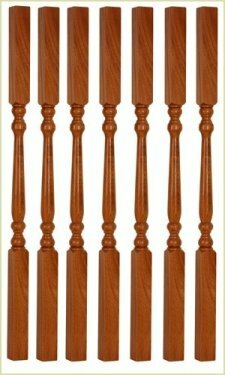 You may also want to consider mixing and matching from our range of balusters. Many of our customers like to use two different designs in an alternating sequence for an individual look. The square, or blank, baluster is an extremely simple design, making the most of clean, structural lines. 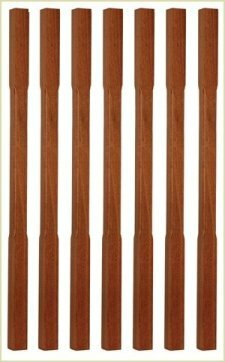 This timeless stye of baluster, while economical, is ideal for showing off a high-quality timber such as sapele or American white oak. 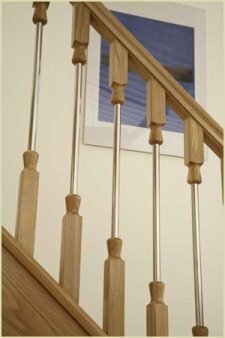 Another simple yet elegant design, the stop chamfered baluster incorporates elements of classical design into a contemporary feature. 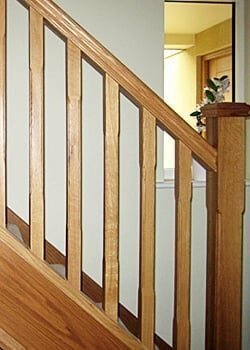 The chamfered, or planed, corners of this baluster incorporate lark’s tongue ends, maintaining the clean lines offered by the square cut while showcasing the quality and texture of the timber used. 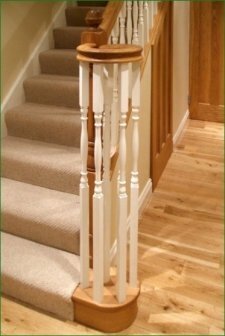 These balusters incorporate ovolo (or ‘quarter-round’) moulding into the chamfered corners of the stop chamfered baluster. Ovolo moulding is a classic design which has been used throughout history, going as far back as Ancient Greece. 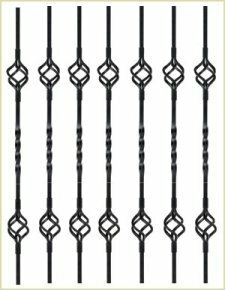 Georgian balusters are our most popular style – we sell thousands of them every year! 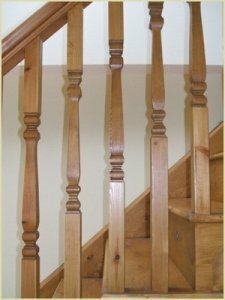 Modelled in the traditional Georgian style, this is one of our turned balusters. Turning is a form of woodworking which involves rotating the timber on a lathe, allowing the woodworker to cut symmetrical shapes around the diameter of the workpiece. The result is an exceptionally elegant balustrade which adds visual interest and an air of quality. This variation of our Georgian baluster incorporates fluting into the shaft for extra impact. ‘Fluting’ refers to the shallow vertical grooves which have been routed out of the shaft of the baluster. 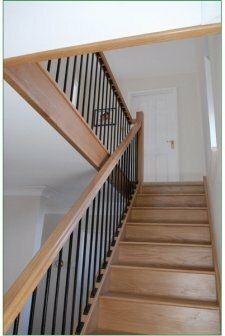 As well as adding visual interest to the balustrade overall, these balusters showcase the texture and quality of the timber and are ideal for use with premium timbers such as American white oak and sapele. 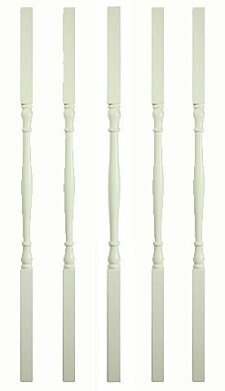 Our Oxford style balusters are similar to our Georgian balusters but feature elongated turns, offering a more rounded look. Unlike the Georgian style balustrade, these are not modelled after a traditionally preferred ‘Oxford style’ of balustrade. 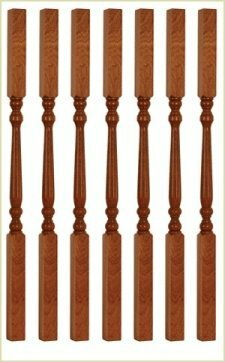 Similar to Georgian balusters, Oxford balusters are available in a fluted design. This refers to shallow vertical grooves which have been routed out of the turned shaft of the baluster. Like the Georgian fluted baluster, this design is ideal for showcasing the texture and quality of the material used. 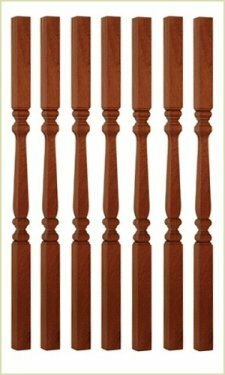 The popular colonial baluster is inspired by American architecture from the colonial era and incorporates smaller diameter turns than the Georgian or Oxford styles. Because this type of architecture was shaped by the timbers most readily available to settlers, there is no better design to pair with an elegant, traditional timber such as oak, ash or pine. 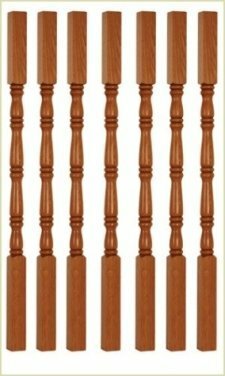 For true colonial authenticity, try this type of baluster in American white oak. This variant on the colonial baluster incorporates vertical fluting into the turned shaft of the baluster, adding a contemporary element to this historical design. 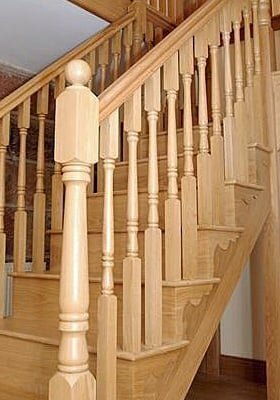 Our colonial fluted balusters are ideal for drawing attention to the style and substance of the timber. 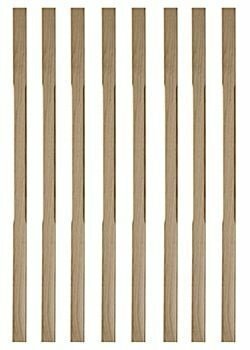 Provincial balusters add a modern touch to the shape of the traditionally turned baluster, featuring square profiled edges rather than rounded ones. This effect is achieved using a square cut, instead of turning, to achieve the straight-edged shaft. 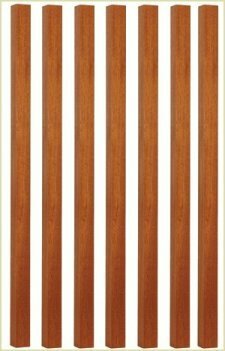 The final result is a shape similar to that of the Oxford baluster, but with the enhanced visual impact offered by square cut edges. 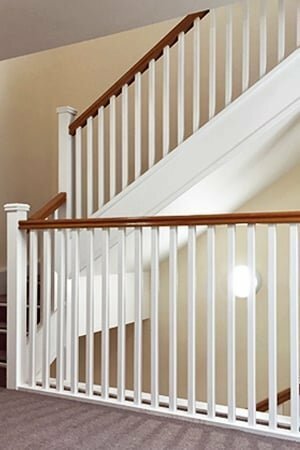 This is ideal for emphasising the straight lines in a clean, simple flight of stairs. 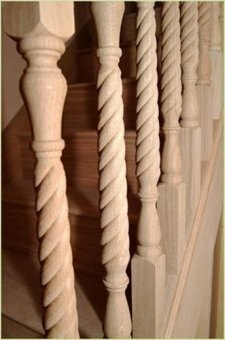 Twist balusters are made by turning each one on a lathe to produce a helical (spiral) cut, creating a twisted effect. Sometimes known as a ‘barley twist’ or ‘barley-sugar twist’, this has been a classic design feature of furniture legs, candlesticks and other household items for centuries. The design is of Baroque origin, dating from the 17th century. A twist effect can be applied to any of our timbers to create a striking impact. Traditionally, decorative twists have been cut from walnut and European oak, making these the ideal timbers to pair with a twist baluster design for an authentic period look. 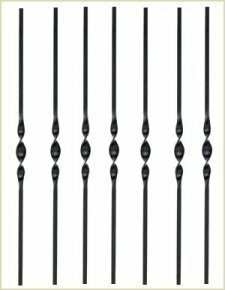 Our Traditional balusters incorporate five pairs of beads set into the turned area for a highly decorative yet tasteful look. 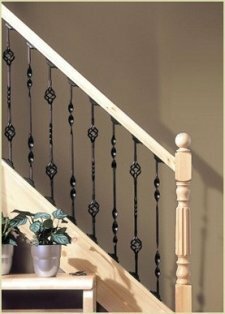 The spacing of the beads gives the baluster a delicate and symmetrical appearance, ideal for the traditional home interior. We think this type of baluster looks best when lacquered and polished to a high shine, making the most of the smooth, light-catching curves of every bead. With an emphasis on light, space and femininity, the Edwardian style of décor made the most of smaller living spaces and narrow entrance halls by incorporating ‘skinny’ furnishings, which left room for manoeuvring and allowed in natural light. 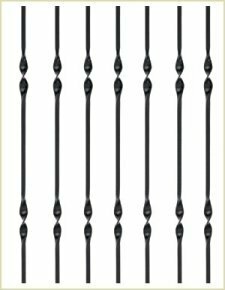 Our Edwardian baluster reflects the period with its slender turn of just 32mm and four similarly slim beads, two inset and two protruding. 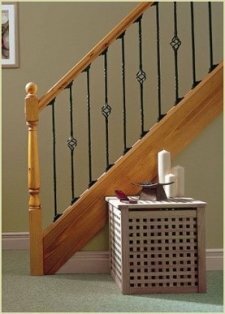 This type of baluster is ideal for use in a smaller home, and would suit a staircase in a confined space. The Imperial baluster design draws inspiration from the Georgian and Victorian styles of décor that were so popular during Britain’s Imperialist era in the 18th and 19th centuries. The turned area features four beads, three of which are inset, one protruding. 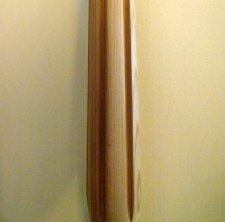 The baluster itself is more imposing than the Edwardian style - with a diameter of 41mm, it is one of our chunkiest designs. 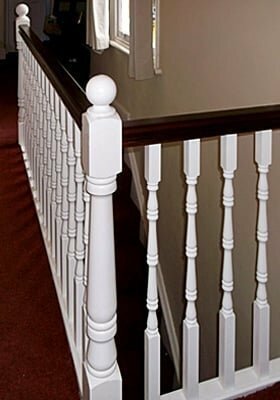 The Imperial baluster is ideal for grand balustrades and will look fantastic in large entrance halls and wide, curved or T-shaped staircases. 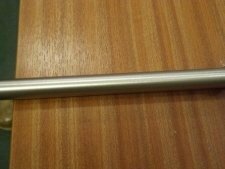 Our metal balusters are made from hard-wearing mild steel, and produced to fit a handrail height of 900mm. They are suitable for use on closed string domestic staircases with a 42° pitch, but can be cut to suit any length. The metal used is a mild (low carbon) steel; easy to cut and quick to install with minimal hassle. 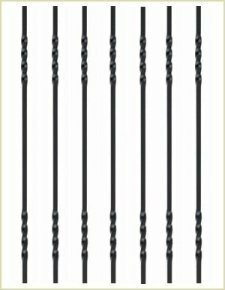 Each baluster has been finished with a black sandgrain coating for optimum corrosion and wear resistance. The Boston style, named after the American city, is uncomplicated and functional, taking the form of a single, straight bar. The effect is simple, neat and modern and lends itself well to a minimalist or other contemporary setting. This style baluster also ideal for mixing and matching with other styles of metal baluster, as its minimalist design will set off the detail in any more complex baluster. Beaufort is a historic district in the state of South Carolina, USA, noted for its surviving antebellum (pre-Civil War) architecture. The hallmarks of this style are symmetrical and highly geometric décor combined with grand statements such as neoclassical pillars and ornate balconies. 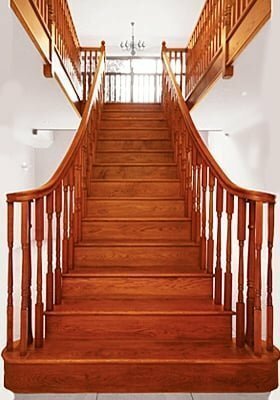 An antebellum staircase often incorporates thick handrails, wide steps and slender balusters. OurBeaufort balusters draw on this period of décor with their inclusion of a simple three-turn centre twist which attracts the eye without overpowering the surrounding architecture. 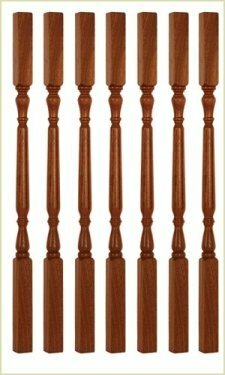 Our Charlston balusters are distinguished by a low-profile, four-turn twist on the top and bottom section of each baluster. Charleston is another historic district in the state of South Carolina which is influenced, like the Beaufort style, by the neo-classical architecture introduced by European settlers. 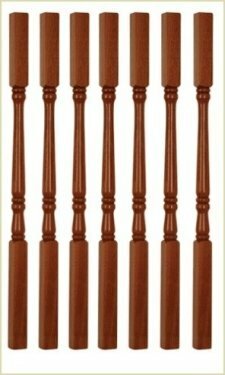 Our Charleston balusters are perfect for mixing and matching with other styles, particularly more decorative designs. 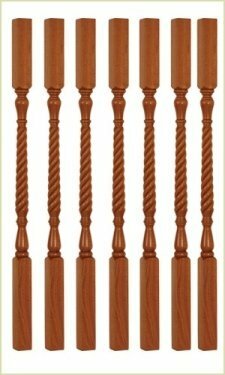 The Nadison balusters have the same simple, wide-profiled style of twist as the Beaufort baluster. 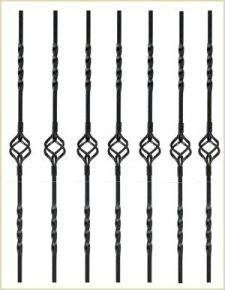 The difference is that they feature a pair of two-turn twists at the top and bottom sections, as opposed to the Beaufort baluster’s single three-turn centre twist. The subtle design of this baluster is again ideal for mixing and matching with more decorative designs. 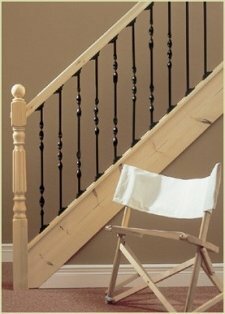 However, it can also make an elegant statement when used as the only type of baluster on a staircase. The Edisto style takes its inspiration from the South Carolinian island of Edisto, reflecting a similar influence to the Beaufort, Charleston and Madison designs. This is one of our most striking metal balusters. Decorative cages adorn the top and bottom sections, framing a low profile four-turn twist at the centre. 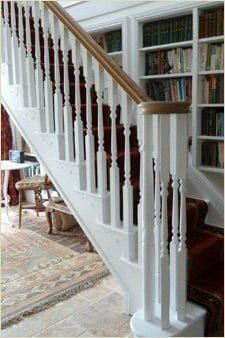 We suggest mixing and matching this style alternately with a baluster of a less complex design to add visual variety to your staircase. 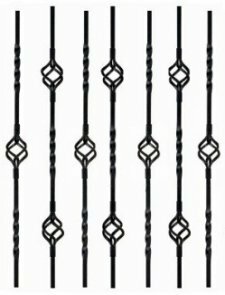 Our Savannah metal spindle reverses the design of the Edisto baluster, featuring a central cage framed by two low-profile, four-turn twists at the top and bottom sections. The effect is a somewhat toned-down variation on the Edisto style. For a striking balustrade, why not try alternating between Savannah and Edisto? 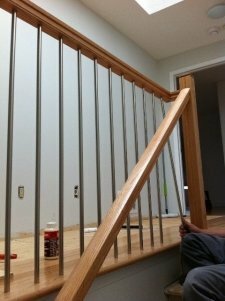 The result is a stylish pattern of cages throughout the banister rail. 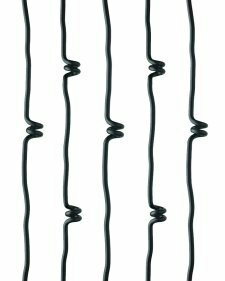 Spiral balusters are available with either a single or double twist. Where only a single twist is incorporated, it is positioned at the centre of the shaft. Where a double twist is used, the two twists are positioned at the top and bottom sections of the shaft. Each twist features two turns. The remainder of the baluster also curves lightly, giving a sense of fluidity. You can enhance the effect of this design by combining single and double twist spiral balusters in the same balustrade, giving a balanced finish. 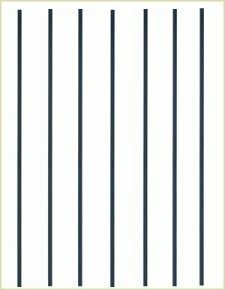 We offer stainless steel and stainless steel-effect balusters in either a chrome plated or brushed nickel finish. 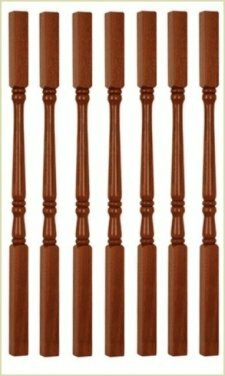 All of these balusters benefit from simple, contemporary designs, as shown below. We recommend using only one kind of steel baluster, rather than alternating with another style, for a clean, simple and contemporary look. 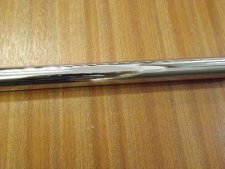 Chrome plating is often simply called chrome and is a technique in which a layer of chromium is electroplated onto the baluster during production. A chrome finish is desirable for its high-shine, reflective properties, and offers increased corrosion resistance. 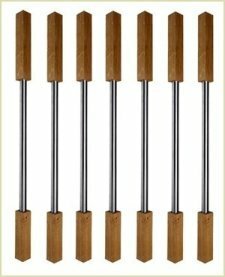 Balusters of this type are produced from a lower grade steel; the cosmetic addition of chrome plating makes the use of a more expensive, high-grade steel unnecessary, as the surface of the steel itself will not be visible. These balusters are made of nickel instead of steel. Nickel is a silver-white metal which is hard and performs very well under tensile stress (stretching or deforming). During manufacture, the surface of each baluster is brushed to a matte or ‘satin’ finish, then softened by buffing away sharp burrs using an abrasive pad. Brushed metal surfaces retain their shine, and gain an attractive pattern of fine lines matching the direction of brushing. Some may find them more pleasant to the touch, due to their soft texture. Brushed nickel balusters may corrode more easily than chrome plated or stainless steel balusters, as the texture makes it easier for fluids to remain on the surface. This baluster design combines traditional square-cut timber sections at the top and bottom with a brushed stainless steel shaft. 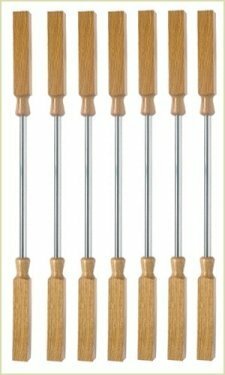 The stainless steel section of each baluster has been given a satin finish using a grit belt or wheel, and softened by buffing away sharp burrs using an abrasive pad. The resulting finish is soft to the touch and covered by an attractive pattern of fine lines. Brushed stainless steel corrodes more easily than polished stainless steel, so be careful not to let these balusters get wet! The Ikon baluster combines traditionally turned top and bottom sections with central stainless steel rods which have been polished to a high shine. The style is designed to appeal to both modern and traditional design sensibilities. We suggest using this type of baluster to bring a traditional home up to date, or to add a touch of classic style to a modern setting.